From Creamer Media in Johannesburg, this is the Real Economy Report. 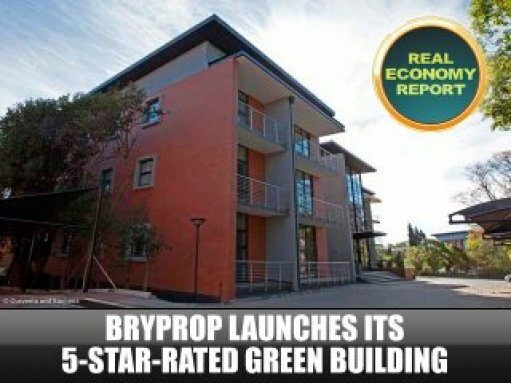 Sectional title development firm Bryprop has enhanced its focus on sustainability with the launch of its new 5 Star Green Star SA rating for its development of the Block E, Upper Grayston building. Nomvelo Buthelezi reports. Becoming the first firm in Gauteng to receive a Green Building Council of South Africa (GBCSA) 5 Star Green Star SA rating for its development of Block E, Upper Grayston has been a big milestone for Bryprop. Solid Green sustainable design engineer Warren Gray explains the key featires of the 5 Star building. “Well the building behind me is Upper Grayston Block E and that was commissioned towards the last half of last year. It has targeted points in many different under the South African Green Star rating. It achieved a four Star Green Star design rating and then went on to achieve a five star as a building rating, it was the highest five star awarded to date and Block F, which will be commissioned later this year will be targeting a 6 star rating. Various Categories under the Green Star rating will include water, energy and indoor environmental quality. On the waterfront the building utelises rain water and during the summer season never uses water from the municipal supply. Similarly there is no energy consumed to heat water in the building all of it is provided by solar. The buildings have good passive and good principal architectural design so the heating and cooling requirements are much lower than most new office developments but even so the building has a very efficient VRF, variable refrigerant volume air conditioning system and there are times on the air conditioning system and motion detection as well as the lighting system. The building gets lots of daylight because of its passive design and because of the fact that you can switch off the lights for most of the day that this building is occupied. Similarly we have put light metering up in the lobby of the building so as you walk in the building the users get a direct instant feedback on how much energy the building is using and it also enables us to see how it performs now that it has been built. At the moment it comes in at 40 watts per square meter, which is half the allowance of the new SANS 10400 XA energy regulation. Gray further explains how the firm plans to achieve a 6 Star Green Star rating on the Upper Grayston Block F development, which is currently under construction. “Block E had a very high 5 Star rating and we needed some more points to get to a 6 star rating for Block F, which had a similar design and similar feature. The main new feature that has been added is the solar photovoltaic system. Approximately 15% of this building’s peak power requirements will be provided to Block F from a solar photovoltaic system and we have seen the prices halve in the last two years from R36 per watt peak to about R18 per watt peak. Gray concludes by adding that Bryprop has provided the building users with an online building user guide, which is not the norm. The Department of Trade and Industry’s Trade and Investment South Africa division recently launched a new development programme, known as the National Exporter Development Programme, which is aimed at bolstering South African exporters’ readiness to compete globally. Trade and Industry Minister Dr Rob Davies has described minerals beneficiation as the “first pillar” on which South Africa’s reindustrialisation should be built. He reports that his department is working with the Department of Mineral Resources and others to integrate beneficiation-supporting regulatory instruments into the amended Mineral and Petroleum Resources Development Act.